For a large swath of North America, this past week was, quite literally, a chilling reminder of the impact of a changing climate. In Washington, D.C., for example, we experienced a nearly 50-degree temperature swing these past couple days—moving from bitter lows late last week to a record-breaking high yesterday. Extreme weather events linked to climate change—from frigid cold or sweltering heat, to hurricanes, tornadoes, typhoons, wildfires and more—are affecting lives and livelihoods. Increasingly, investors are taking note and asking companies to disclose how they are addressing their climate impacts. In 2018, over 650 investors with over $87 trillion in assets, and 115 major purchasing organizations with $3.3 trillion in purchasing power, requested data from CDP related to environmental impacts, risks and opportunities. Thousands of companies, including HP, annually report to CDP for independent assessment against its scoring methodology. Today, I’m proud to announce that for the fifth consecutive year, HP has achieved a place on the CDP Climate Change A List for our actions to cut emissions, mitigate climate risks and develop the low-carbon economy. And for the third consecutive year we’ve been named a CDP Supplier Engagement Leader. In addition, for the third consecutive year HP received a leadership ranking on CDP’s Forests List for managing and reducing deforestation risk associated with sourced commodities like timber used in HP-branded paper and packaging. In 2017, HP was one of only 28 global companies—less than 1 percent—out of 3,300 assessed by CDP to be named to the inaugural Supplier Engagement Leader board. Today, we’re among 3 percent, as one of 130 companies recognized out of 5,000 assessed. While the number of companies taking an industry-leading approach has more than doubled each of the past two years, CDP’s 2019 report shows only 35 percent of companies analyzed are reporting active engagement with their suppliers on climate change. This must change. To align with science-based climate targets and fully transition to a new sustainable economy we must accelerate climate action across all industries and into supply chains. Active supplier engagement is essential to driving this necessary systemic change. 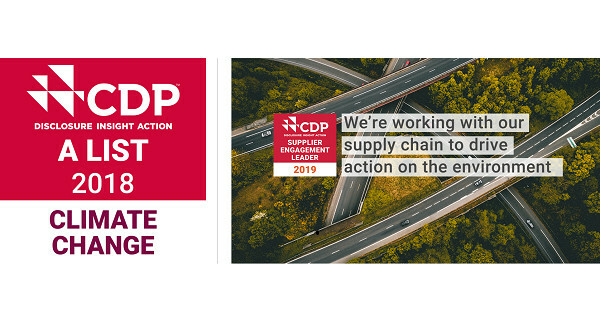 CDP’s Global Supply Chain Report 2019 released today, Cascading commitments: Driving upstream action through supply chain engagement, shows that, collectively, the 115 members of CDP’s supply chain program reported emissions reductions of 633 million metric tons of carbon dioxide (that’s greater than the emissions of South Korea in 2017)—representing a cost savings of $19.3 billion. At HP, our supply chain accounts for almost half of our total carbon footprint, so it’s imperative that we work closely with our production and nonproduction suppliers to lessen negative environmental impacts. I reached out to James Riddle, HP’s Global Supply Chain Environmental Manager, to ask how leading companies can better engage with their suppliers to reduce negative environmental impacts across their value chain. 1. Transparency. Be transparent in your own measurement and reporting and expect the same from your suppliers. Since 2012, we’ve measured and reported our environmental footprint across the value chain, and this includes tracking our suppliers’ greenhouse gas (GHG) emissions. Since 2008, we’ve annually collected data from our suppliers using industry and cross-industry standard reporting platforms, such as the CPD Supply Chain program and the Responsible Business Alliance (RBA) Online Environmental Survey. We emphasize with our suppliers the need to accurately measure climate impacts and determine climate-related risks. In a further demonstration of our commitment to transparency, we annually publish a list of our direct production suppliers along with links to their public sustainability reports. 2. Goals. Set quality environmental impact reduction targets that include your supply chain and encourage your suppliers to set their own science-based GHG emissions targets. Nearly six years ago, legacy Hewlett-Packard Company became the first in the IT industry to set a GHG emissions reduction goal for its first-tier manufacturing and product-transportation supply chain partners. In 2017, as the new HP Inc., we reaffirmed our commitment by setting a new GHG emissions intensity reduction goal, as well as a goal aimed at doubling factory participation in supply chain sustainability programs. We worked with World Wildlife Fund’s (WWF) Climate Savers Program to set new supply chain targets, and seek to reduce GHG intensity by engaging directly with suppliers to meet stringent management and transparency requirements, set goals for their operations and improve collaboration and ongoing performance. 3. Prioritize. If your supply chain is expansive, identify the subset of your suppliers that represent the greatest opportunity to reduce your Scope 3 emissions. HP’s hundreds of production suppliers (those who make HP products or make components for HP products) and thousands of nonproduction suppliers (those who provide goods or services that don’t go into products) are essential partners in our efforts to embed sustainability across every aspect of our business and reduce GHG emissions across our value chain. We focus our data collection on about 4 percent of our suppliers by number, which constitutes about 94 percent of our total direct and indirect procurement spend. 4. Incentivize. Give suppliers another reason to act by connecting climate performance to increased business. HP’s Sustainability Scorecard is an important tool to drive supplier performance. With it, we set requirements that go beyond general industry expectations and raise the bar for our suppliers, such as setting science-based GHG emissions reduction targets, third-party verification of GHG emissions and high levels of transparency. HP’s Sustainability Scorecard is integrated into HP’s general procurement scorecard and directly ties ongoing procurement decisions to supplier sustainability performance, ensuring sustainability is prioritized in business decisions. Suppliers with strong sustainability performance see greater opportunities for new or expanded business with HP, while suppliers with persistently low sustainability performance may see reductions in our business. 5. Collaborate. Seek out others—including NGO partners, experts within and across industries and even your competitors—to grow collective capabilities, reduce impacts and rise together. For more than a decade, HP has been a leader in the RBA Environmental Sustainability Workgroup. Together with our peers, we built the first IT supply chain environmental survey to collect GHG, water and waste data from suppliers. Another example is HP’s Energy Efficiency Program (EEP) in China and Southeast Asia, an initiative for reducing production suppliers’ utility costs and environmental footprint. Collaborating with BSR, the World Resources Institute and WWF, we implemented the program to help suppliers build capabilities, improve energy efficiency and explore the use of renewable energy. Since 2010, more than 200 supplier sites have joined and benefited from EEP, saving a cumulative $86 million, reducing energy consumption by 665 MWH and contributing to the prevention of more than 1 million tonnes of CO2e emissions from product manufacturing and transportation. According to the Global Commission on the Economy and Climate, bold action on climate change could deliver $26 trillion in economic benefits through 2030. The steps your company takes to reduce its negative environmental impacts can be amplified (or should I say, can “snowball”) many times over when you engage your supply chain in taking climate action. What bold action are you driving with your suppliers? Please join the conversation.